Route.—-In the only study of the transportation problem to date, Atkinson (1956) suggested that the Stonehenge sarsens originated on the Marlborough Downs because the largest outcrops occur there today. According to him, selected sarsens were dragged to Avebury, “blessed”, then dragged one at a time on sledges over hardwood rollers to Stonehenge. 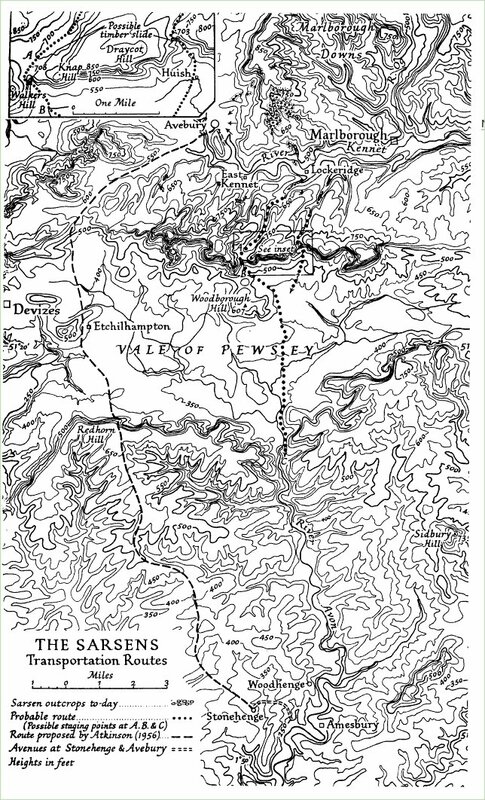 To avoid the steep descent of the Chalk escarpment Atkinson swings his route westwards to cross the Vale of Pewsey at its narrowest point (Fig. i). Using this route Atkinson (1956, p. 115) calculated that the eighty-one sarsen stones were moved one at a time, at an average speed of half a mile a day and the task occupied 1500 men for ten years. 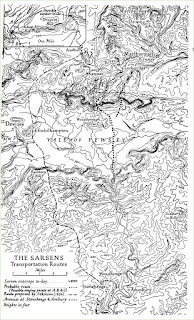 Later he suggested that the minimum hauling party for the heaviest stone would be 100 men, increased to 450 up Redhorn Hill (written communication, 1958). These figures are for the haulers only and do not include the additional men required to shift the rollers and steer the sledge. Despite the advantages there are six objections to Atkinson’s route. (i) The labour requirements are large. (ii) The route is 4 miles longer than necessary. (iii) A surprising number of sarsens outcrop south of the Kennet—many admittedly are smaller than those on the Marlborough Downs, but this may simply mean that the larger stones have been removed. 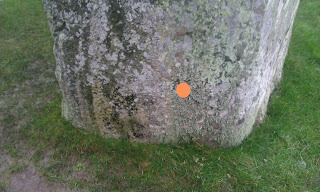 (iv) Avebury does not lie on the direct route to Stonehenge. 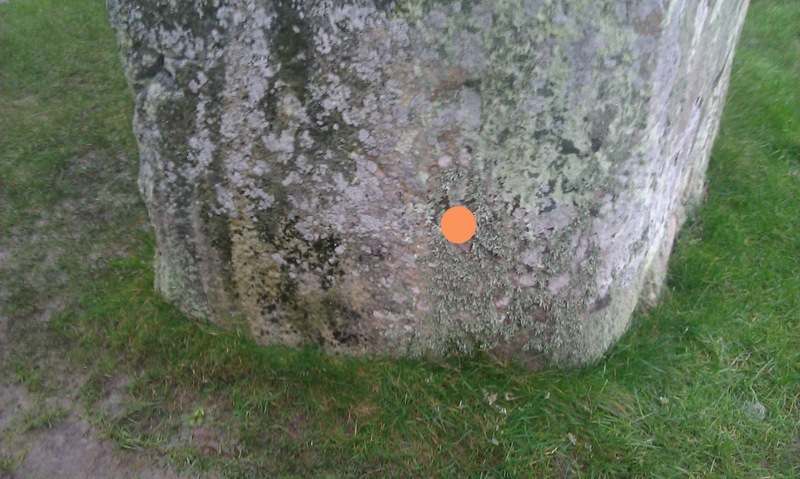 (v) It would be easier to have the stones blessed in situ. (vi) The ascent of Redhorn Hill is unnatural, unnecessary, and more than negates any advantage of the detour. ...The free slide invoked for stage (ii) is the easiest, fastest and safest way of lowering the sarsens the necessary 150 feet. The actual positions of the slides are conjectural. The ones shown are thought to be the most likely. They are the steepest and the short est and are the nearest to the gaps through the Downs. They are sheltered from the westerly winds and are also partly sheltered from the sun. The slides may have been over snow, grass or bare chalk and the sarsens may have been slid downhill on their sledges, or they may have been tipped off and slid downhill on their own to accumulate at the bottom to await the next stage of their journey. 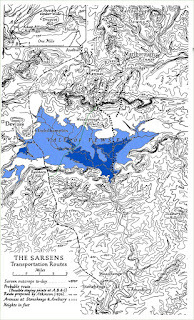 Along the Avon valley, stage (iv), the route would lie east of the river to avoid the two tributaries. If the depth of water were the same as today (2 feet) the stones could not have been floated, they must have been dragged and at places, to avoid river bluffs, they may have been dragged through the water. The number of river crossings is unknown; meanders may have changed position. On the basis of today’s positions, only one or two crossings are necessary. The idea that the stones might have accumulated at staging points is logistically attractive. Each stage of the route presents special problems and each, for maximum efficiency, might have been the responsibility of one group of workers. Eating and sleeping arrangements would be simplified, and the distance that each group would have to travel would be reduced. Conclusions.—Whether the sarsens were hauled over rollers or sledded over snow or slush, the route postulated with a slide or slides down the chalk escarpment appears to be the easiest and most logical. The suggestion that the accumulation of snow was greater at the time the sarsens were moved cannot be proved—but it cannot be disproved. Hill was correct to challenge Atkinson's route for the reasons he gave. But he missed the largest problem with Atkinson's route, it crosses the Vale of Pewsey through a marsh and over an unnecessary hill. 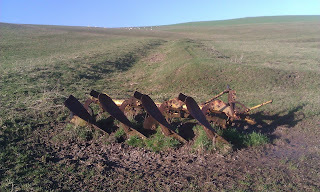 Hill worries too much about the difficulty of pulling a large sledged weight across dry ground. 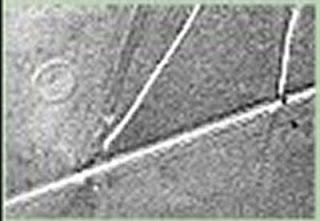 More recent research by Julian Richards and Mark Whitby (1997) showed that a 40 tonne stone on a sledge on a greased track could be moved up a 1 in 20 slope by 130 individuals. His suggestions of ice tracks and packed snow are not supported by climatic data nor are they needed for practical reasons. 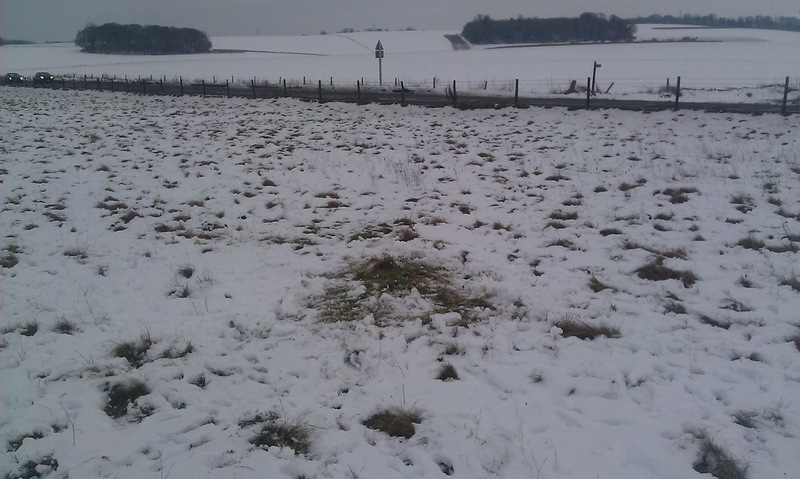 His route from the base of the Marlborough Downs and down the Avon Valley is problematical. 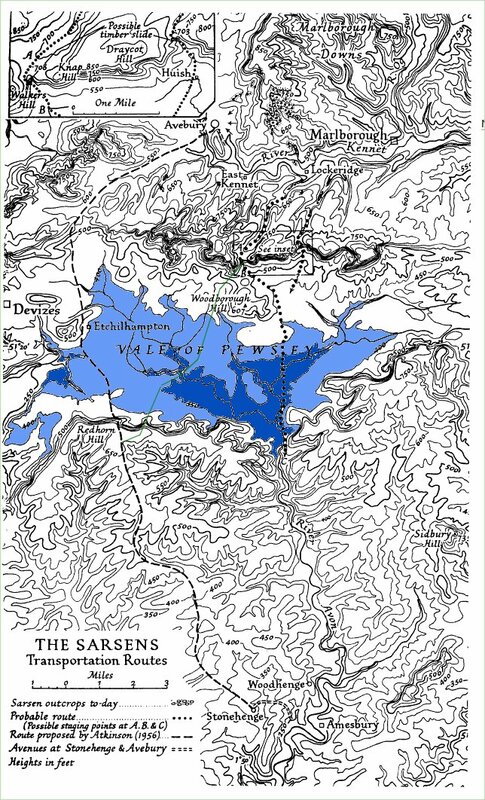 He admits the water is too shallow to float the stones, and the Vale and river valley would have been a swamp before the river was canalised. A swamp with trees is not an easy route. The route I suggested in The Origin Of The Stonehenge Sarsens leaflet minimises all theses problems and takes the most practical aspects of Atkinson's and Hill's routes. It follows Hill's route across the Marlborough Downs, though I think the stones would have been brought down the gentle routes above Alton Barnes and Stanton St Bernard rather than launched over the steepest slopes. 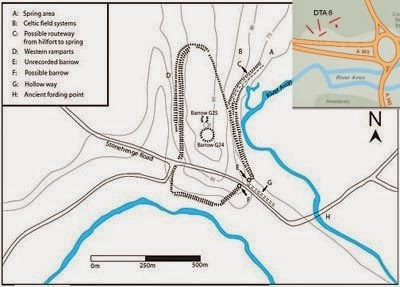 It then follows the narrow watershed between two branches of the River Avon to Marden Henge (where any blessing could take place - pace Atkinson) where the river is the narrowest and easiest place to cross, and the least marshland has to be crossed of any point in the Vale. 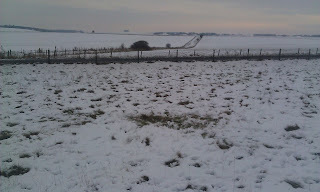 It then goes up the escarpment at Chirton Maggot, or one of the other similar benign slopes before joining Atkinson's route across the Plain. A modified map showing the three routes and land below 400 and 350ft contours. 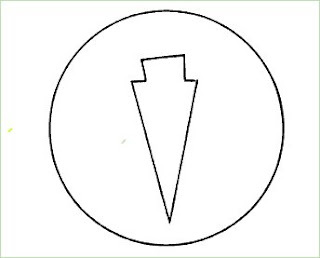 A Dagger on Stone 30? 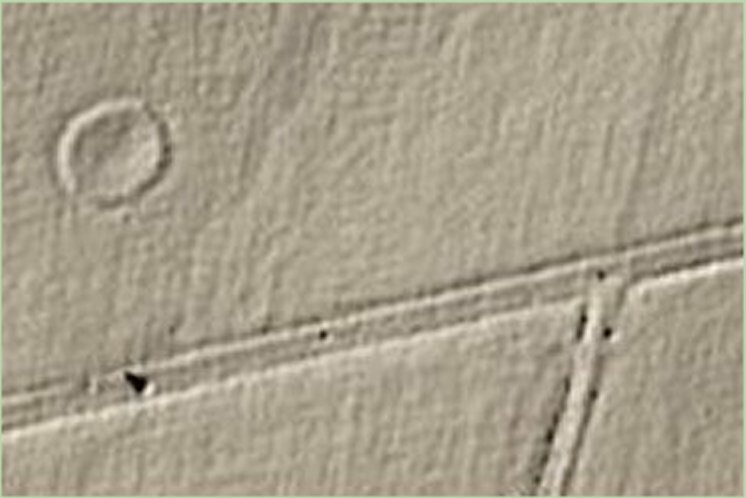 A DAGGER IN RELIEF ON STONEHENGE? The area was thickly covered in lichen at the time of the Laser Scan and it is hard to make out but there is a shape in relief, standing out by about 4mm, in a rough circle. It doesn't seem to be a figment of the stoneworking but it is very unclear. The spot is marked here. A Second Dagger on Stone 23? 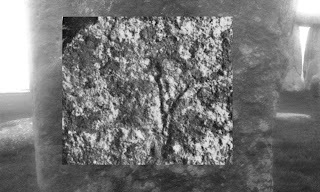 He is mainly talking about a dagger carving on Stone 30 which I will deal with another day but he includes a picture of the dagger carving on Stone 23 - no credit or date for the photograph is given, but the other photographs in the article were taken in 1974. A very clear dagger. 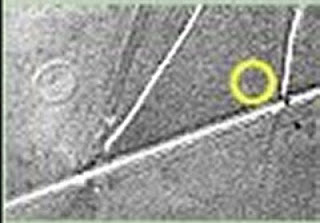 But is it the dagger that was originally spotted and confirmed by the recent EH laser scan report? 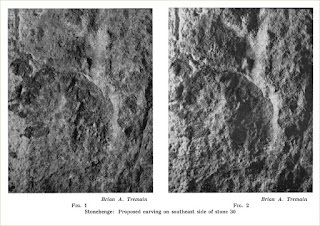 Close examination of the stone and carving, and rotating and scaling the picture lead me to the conclusion it is the same carving, just looking very different. 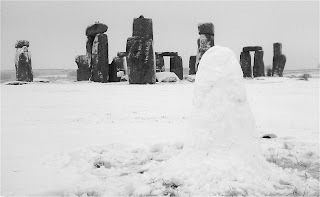 A Missing Sarsen Magically Reappears! 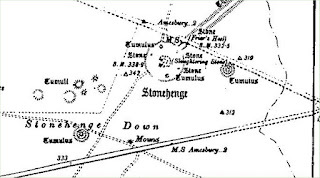 Several writers on Stonehenge in the eighteenth and nineteenth centuries express a belief in the former existence of stone just inside the bank on the south—west side, neighbourhood of Aubrey Hole 28, which would marked the prolongation of the axis, and incidentally the approximate point of midwinter sunset. 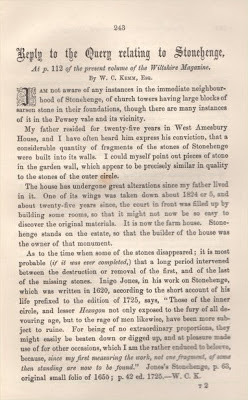 No one has ever seen this stone, though Mr. W. A. Judd, one of the leading nineteenth-century authorities on the lithology of Stonehenge, reported that he had found its stump ‘still in the earth, about a foot under the surface’. A later search made with a sword and an auger by the then owner of Stonehenge failed to confirm this claim, and the existence of this stone must remain problematical. When I went to work yesterday morning the pixies had re-created the missing stone - magical! 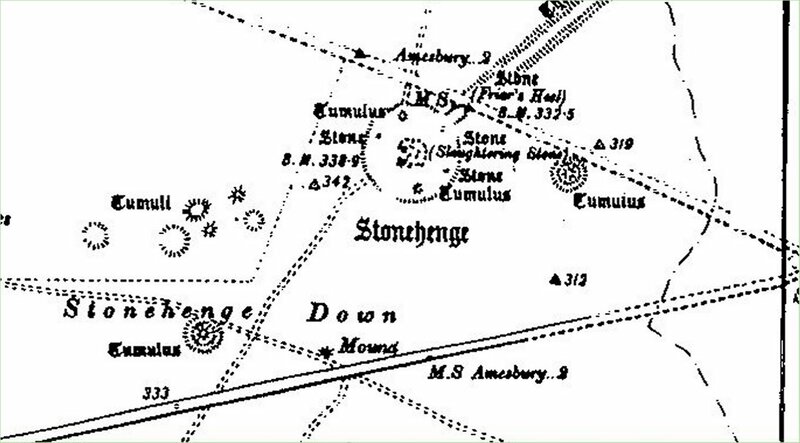 The 1899 (and 1877) OS maps of Stonehenge show a "mound" to the south of the monument near to what is now the A303 where the old track to Springbottom Farm crosses the road. 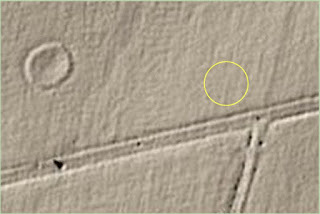 Here's a detail from an aerial photo taken in 1944 looking south west; the yellow circle in the marked version show where the mound should be. Am I imagining a visible trace of it? This black and white photo was taken in 1922. Again there seems to be a trace. 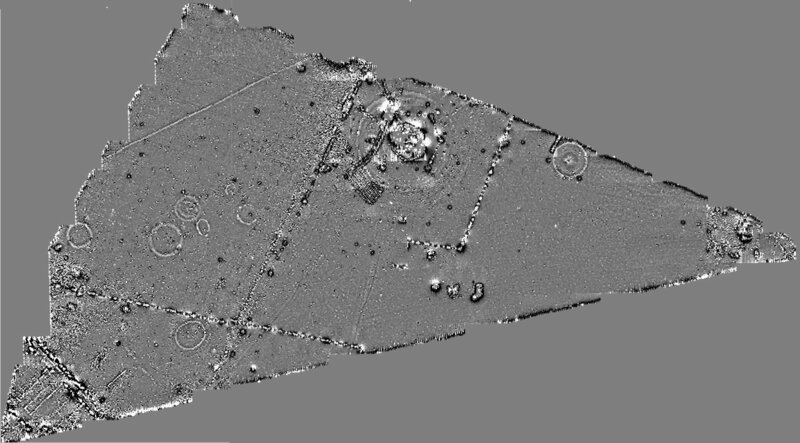 And in the recent Lidar image? 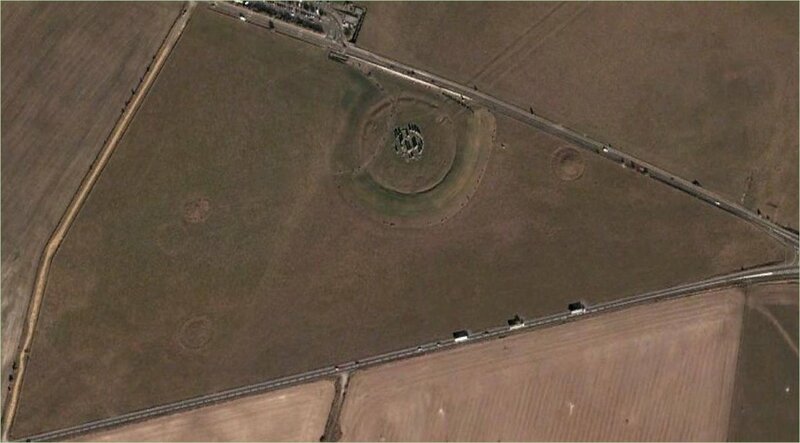 In all of them the "mound" looks like similar in size to the nearby barrow. Is that what it was? On the ground investigation. Just where expected there seems to be a very small mound still there. obviously it is hard to judge on an uneven field with tussocky grass but I thought I could find it, and also a hint of a circular ditch around it, as in the pictures above. It might be imagination but it is worth further investigation. The National Library of Scotland offers a side by side georeferenced view of old OS maps and modern satellite imagery. I have never found any reference to this mound or what it may have been. With the ongoing discovery of Mesolithic finds just south of the A303 here I thought it interesting. Much more of course in the full paper. With more news of David Jacques' fantastic Mesolothic finds at Blick Mead near Vespasian's Camp I thought it worthwhile adding a diagrammatic map showing his finds and these earlier ones. open late glacial landscape to one dominated by forest. c. 8280–7200 cal. BC (8640±200 BP; GU-3239). hazel and incoming oak and elm (Scaife 2004). activity has been forthcoming from the region. enable any statistically reliable interpretations. The raw material comprises locally available chalk flint. 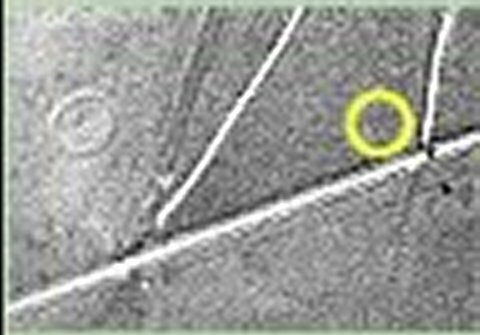 Four ways to see the Stonehenge Triangle - Update "Five ways"
The marked "Mound" on the OS Map at the bottom centre is a mystery to me, any ideas? The Highways Agency has a large number of archaeological reports that have been commissioned for various road schemes across the country. They are available on request as emailed pdfs. Of course my interest is mainly in the Stonehenge area so I requested and was sent two. A history of the Marlborough Downs in a photograph. The Marlborough Downs east of the A361, south of the A4 and north of the Wansdyke are a wonderful lonely space to explore. 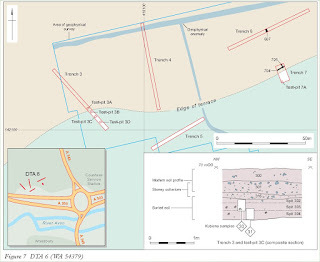 Old maps show many ditches, dykes and enclosures with Sarsen stones dotted around. 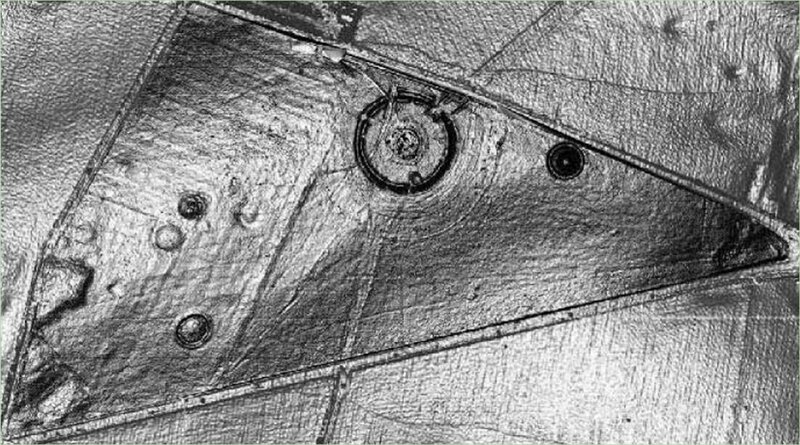 The old sheep runs were ploughed up during the twentieth century and many of these features were obliterated. 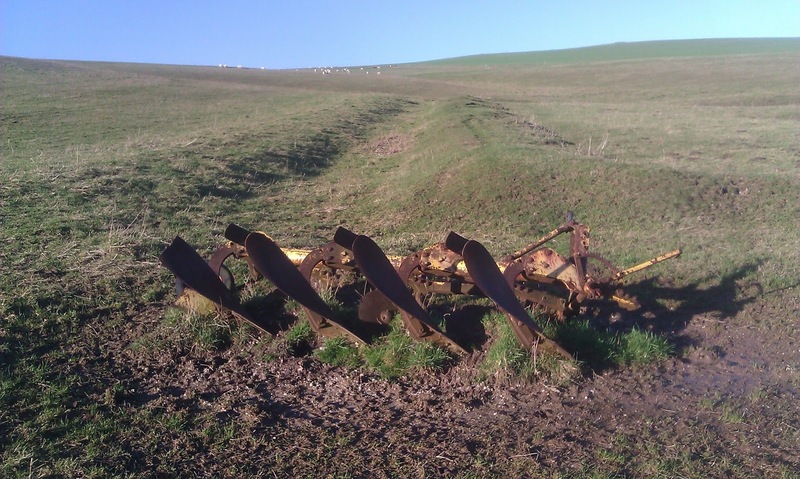 But now the downland is being recreated in parts and the plough lies rusting. But the loss of heritage is lamentable. Badgers, rabbits and moles are also busy at work returning tumuli and banks to featureless downland. But enough remains to fascinate, do visit. "There is no doubt, in our judgment, but that Attorney-General v. Antrobus was rightly decided; for no such right can be granted (otherwise than by Statute) to the public at large to wander at will over an undefined open space, nor can the public acquire such a right by prescription." Although the use of these Latin words may seem out of date in present circumstances, they serve nevertheless as a valuable reminder of the place which the right to assemble must occupy in the context of the law relating to real property. Easements and public rights to land which are acquired by user or by dedication are limited rights, as against the occupier or owner of the land which is affected by them. They are granted or acquired for a particular purpose only, and they are not to be confused with the use of the land for other purposes. Thus a right of way or passage is entirely different from a right to walk about or a right to remain in one place. The law recognises that a right of way or passage may be acquired by user or by dedication. But it takes a different view of the right to walk about or to remain in one place. These are not rights which the public can acquire by user or by dedication. If rights of this kind can be acquired at all they can be acquired only by express grant. So they cannot be included among the rights of access which the public can enjoy as of right without the consent of the landowner. 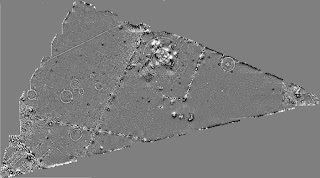 English Heritage has released a complete panoramic view of Stonehenge from the centre, move around with your mouse. 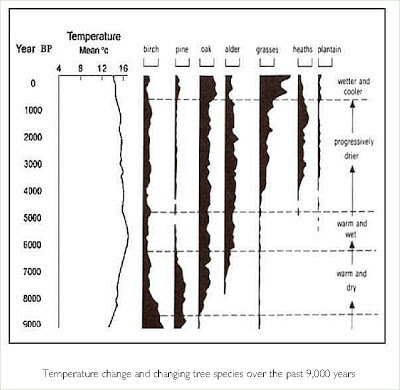 Interestingly, the changes predicted for the 4000-4500BP period by the Bridge CGM are actually quite similar to the predictions of future climate change in the UK (Wilby et al 2006), which implies that we are moving back to a 4000-4500BP climate in the UK. 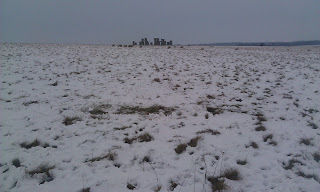 Of course this is around the period when the Sarsen stones are presumed to have been transported from the Marlborough Downs nearby and across the Kennet to Stonehenge. 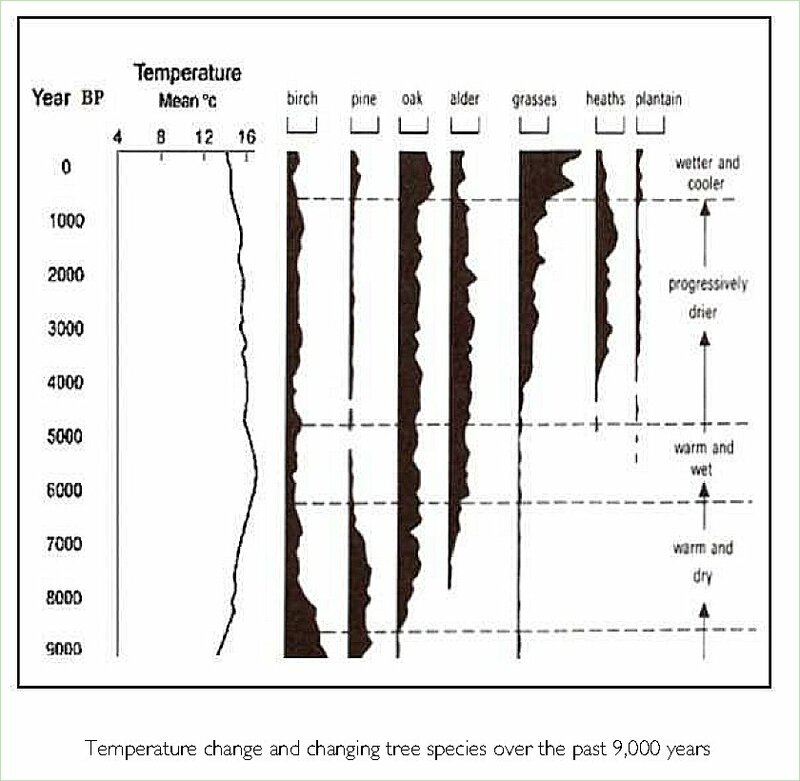 Can we please not mention sliding them on ice down the frozen Avon again; that theory is just not compatible with the climatic evidence. 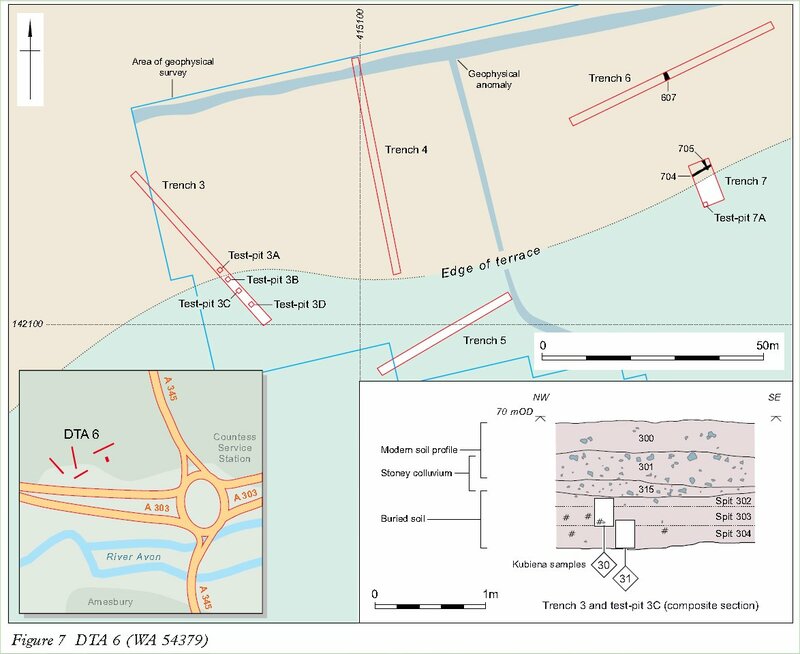 A comprehensive, though probably not complete, list of Stonehenge excavations - based on http://eprints.bournemouth.ac.uk/9689/7/151-158_appendix_1.qxd.pdf, with the publications of their reports. 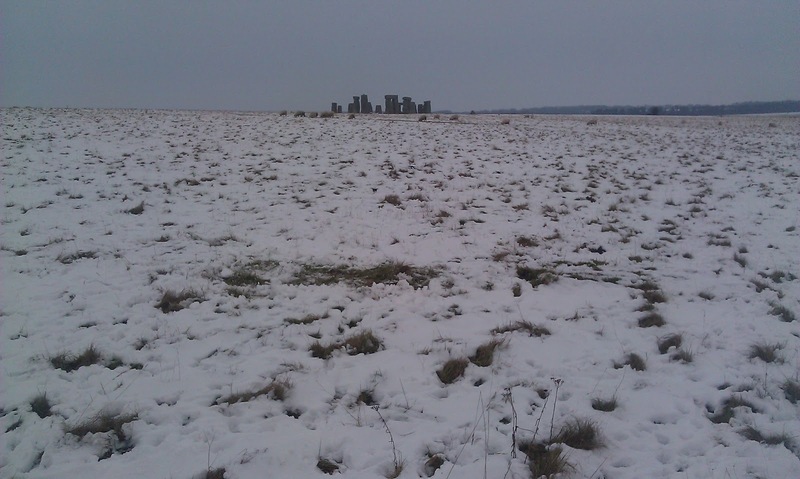 Britain vulgarly called Stone-Heng on Salisbury plain. later known as the Aubrey Holes. Aubrey, J, 1693 (edited by J Fowles 1982), Monumenta Britannica. 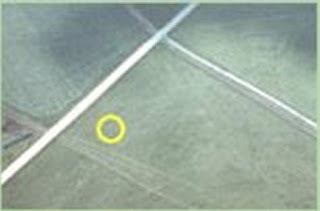 Stonehenge and its field monuments. 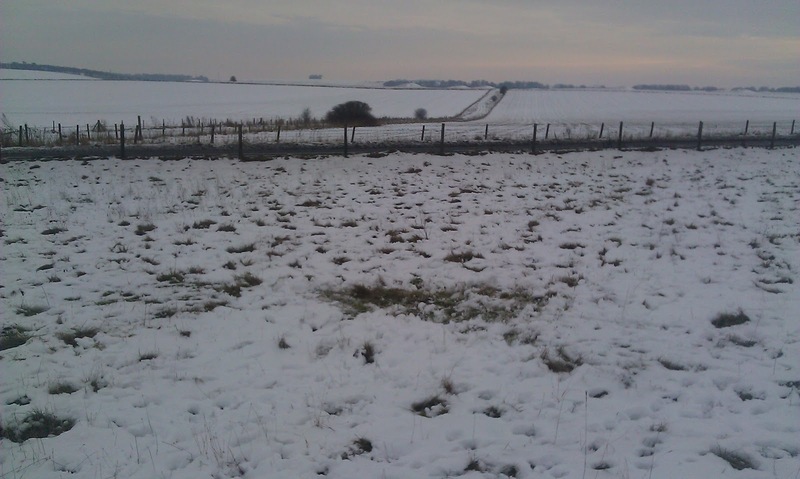 beyond Stonehenge Bottom to King Barrow Ridge. 1723. William Stukeley discovered the Cursus. (numbers 56 and 57) at Stonehenge. 1839. 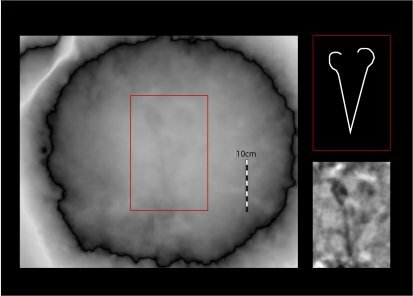 Captain Beamish excavated within Stonehenge. Stonehenge and numbered the stones. Petrie, W M F, 1880, Stonehenge: plans, description, and theories. excavated around stone number 56 at Stonehenge. Gowland, W, 1902, Recent excavations at Stonehenge. Office of Works and later for the Society of Antiquaries. Heritage Archaeological Report 10). London: English Heritage. 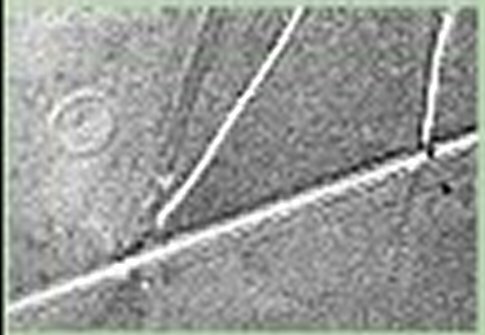 Hawley, W, 1922, Second report on the excavations at Stonehenge. Hawley, W, 1923, Third report on the excavations at Stonehenge. 1929. Robert Newall excavated Stone 36. 1935. Young . Car Park area. 1950. Robert Newall excavated Stone 66. 1952. Robert Newall excavated Stones 71 and 72.
previously undisturbed areas within Stonehenge. 1968. Faith and Lance Vatcher Geophone and floodlight cable trenches. on behalf of the Central Excavation Unit. 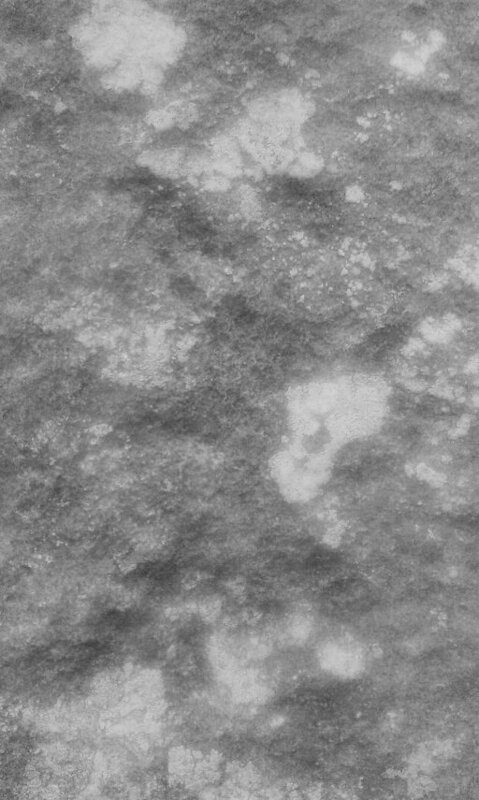 Pitts, M W, 1981, The discovery of a new stone at Stonehenge. 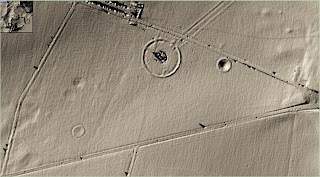 investigations beside the A344 in 1968, 1979 and 1980.
the construction of the footpath through Stonehenge. 1994. Wessex Archaeology. Limited Auger Survey. 2008. 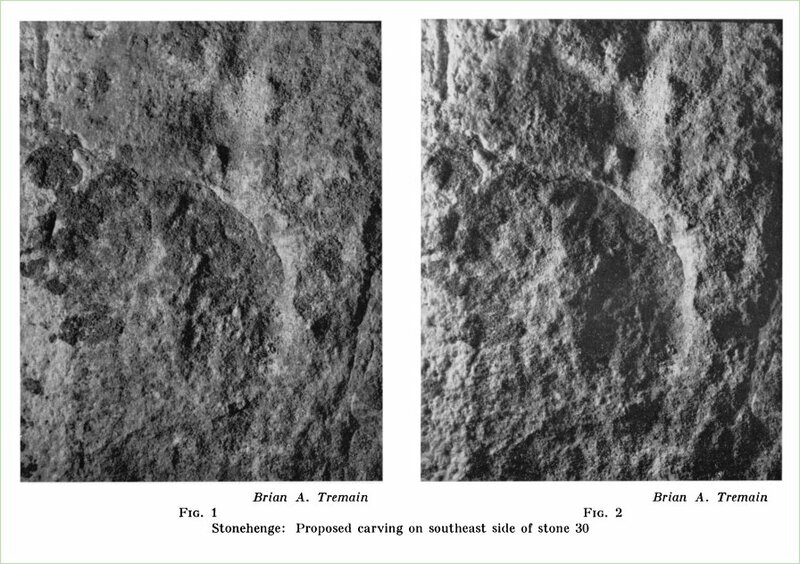 Timothy Darvill and Geoffrey Wainwright set out to date the construction of the Double Bluestone Circle at Stonehenge and to chart the subsequent history of the bluestones and their use at the monument. 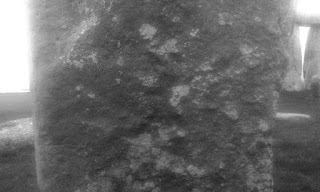 West Amesbury House - Sarsen Stone Foundations? I AM not aware of any instances in the immediate neighbourhood of Stonehenge, of church towers having large blocks of sarsen stone in their foundations, though there are many instances of it in the Pewsey vale and its vicinity. 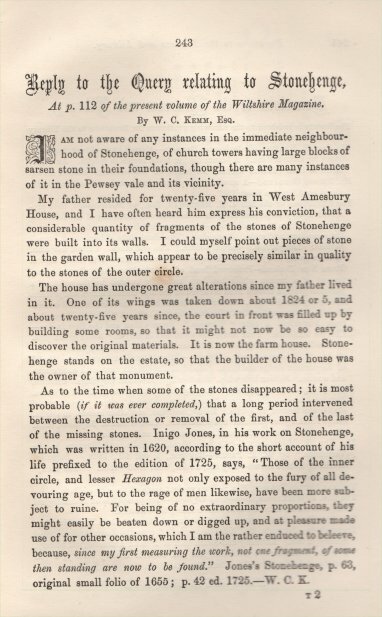 My father resided for twenty-five years in West Amesbury House, and I have often heard him express his conviction, that a considerable quantity of fragments of the stones of Stonehenge were built into its walls. I could myself point out pieces of stone in the garden wall, which appear to be precisely similar in quality to the stones of the outer circle. The house has undergone great alterations since my father lived in it. One of its wings was taken down about 1824 or 5, and about twenty-five years since, the court in front was filled up by building some rooms, so that it might not now be so easy to discover the original materials. It is now the farm house. Stonehenge stands on the estate, so that the builder of the house was the owner of that monument. As to the time when some of the stones disappeared; it is most probable (if it was ever completed,) that a long period intervened between the destruction or removal of the first, and of the last of the missing stones. Inigo Jones, in his work on Stonehenge, which was written in 1620, according to the short account of his life prefixed to the edition of 1725, says, “Those of the inner circle, and lesser Hexagon not only exposed to the fury of all devouring age, but to the rage of men likewise, have been more subject to ruine. For being of no extraordinary proportions they might easily be beaten down or digged up, and at pleasure made use of for other occasions, which I am the rather enduced to believe, since my first measuring the work, not one fragment ,of some of then standing are now to be found.” Jones’s Stonehenge, p. 63, original small folio of 1655; p. 42 ed. 1725.—W. C. K..